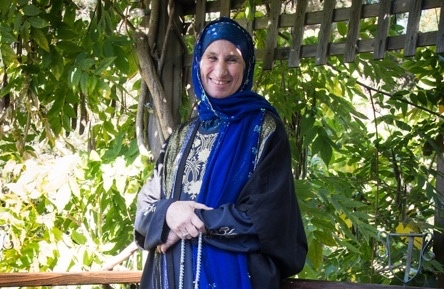 She then was guided to study intensively with Sufi Masters around the world, with Sheikh Bawa Muhaiyadeen (ra) in Sri Lanka and Philadelphia, with Sheikh Abdoulaye Dieye (ra) and Sheikj Aly N’Daw in Senegal and the US, and with Sheikh Harun Faye in Senegal, and the US. She has received the permission to teach in the Muridiyyah and Mustafawiyyah Tariqahs. The permission to teach (ijaza) is , in reality, the responsibility to serve and to share. Thus, through her years of traveling on the spiritual journey, has she discovered and transmitted the ever deepening experience of ibadat: the love, worship, and service of our Beloved Lord. She has described the deep journey of transformation in a book entitled: ” Journey Through Ten Thousand Veils, the Alchemy of Transformation on the Sufi Path. ” This book is a significant and revealing spiritual and social commentary dispelling many myths and stereotypes, such as the proposition, often fostered by the media, that women are inevitably oppressed in Islam. On the contrary, it is by entering into the heart of Islam that the author was liberated, elevated, empowered, and guided to realize the true purpose of her existence.